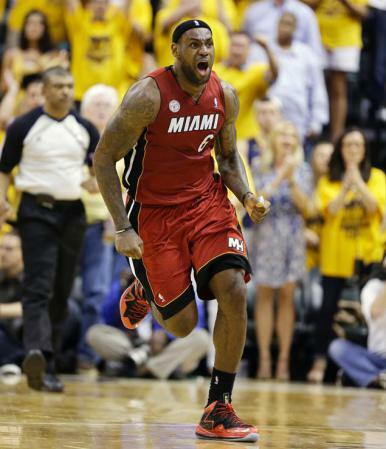 LeBron James reacts to an offensive foul called against him during Game 6 of the 2013 NBA Eastern Conference Finals against the Indiana Pacers. He continued to talk about how he noticed the style of play in Oklahoma, especially in the boys game, change to more resemble the NBA after the Seattle SuperSonics moved to Oklahoma City in time for the 2008-09 season. The NBA has fallen under scrutiny for several things, including the large amount of travels that go uncalled. I once watched a playoff game where former Celtics Forward Kevin Garnett took 4 steps and dunked after picking up his dribble. No whistle. Many current high school players are even behaving in similar manners. In the same game I mentioned earlier, I called an offensive foul. The player who drew the foul got up and bodied up to the offensive player, leaving me no choice but to issue a technical foul. There are similar cases in other sports such as football and baseball. This serves as a sports example of the trickle-down effect.